Dry skin – one of the uncomfortable and common skin conditions faced by people during winters. It occurs when the skin doesn’t retain moisture in it. This can be caused due to many factors that include hot water baths, dehydration, harsh soaps, dry weathers and certain medicinal conditions. If dry skin is not treated on time, then it can lead to dermatitis. The itching and scaling caused by dry skin can be irritating and annoying. Most of the heavy duty moisturizers and commercial treatments contain harmful chemicals that can damage the skin. Thankfully, there are some natural DIY home remedies such as olive oil that can be used to treat dry skin without causing any side effects. Is Olive Oil Useful for Dry Skin? Olive oil contains vitamin E, a potent antioxidant that protects the skin against environmental factors such as sun rays and the wind. The healthy fats present in olive oil moisturize the skin and prevents it from drying out. It also seals moisture inside the skin cells by forming a protective layer on the skin surface. The anti-aging properties of olive oil reduce the appearance of wrinkles and fine lines which is a common problem associated with dry skin. Olive oil promotes skin cell renewal which removes the dry, damaged and dead skin cells. It also smoothens out the rough and coarse texture of dry skin. 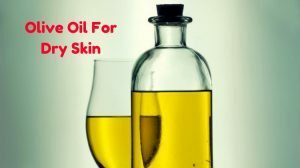 How to Use Olive Oil for Dry Skin? Olive oil can be used alone or in combination with other natural ingredients to treat dry skin. We have mentioned the best remedies below for your convenience. Take 2 tablespoons of olive oil in a bowl. Massage the oil thoroughly over the dry skin for 5 to 8 minutes. Wait for another 15 minutes and let the oil penetrate into the skin. Rinse off the application with mild cleanser and warm water. The humectant property of honey traps moisture within the skin and prevents it from drying out. Its powerful antioxidant properties protect the skin cells against free radical damage and promote cell renewal. Take a tablespoon each of organic honey and olive oil in a bowl. Whisk the ingredients with a fork. Apply this mixture all over the face and massage for 5 to 10 minutes. Rinse off the application with lukewarm water and pat dry. Repeat the method once in 2 days. The combination of sugar and olive oil creates a mild exfoliating scrub that helps to get rid of dry and dead skin cells without damaging the skin. In addition, glycolic acid present in sugar helps to maintain perfect oil balance in the skin and prevents it from becoming excessively dry. Add a tablespoon of sugar to it and give it a stir. Apply this mixture all over your face and massage for 5 to 10 minutes. Leave it on for another 15 minutes and then rinse off with lukewarm water. Repeat this remedy 2 to 3 times in a week. The combination of salt and olive oil creates a mild exfoliating scrub that removes dry and dead skin cells from the skin surface. Salt also helps to balance the oil production in the skin and prevents dryness. Take 2 tablespoons each of olive oil and salt in a bowl. Stir it with a spoon and apply this mixture all over the face. Massage with your hands for 5 to 10 minutes. Leave it on for 10 minutes and rinse off with water. The monounsaturated fatty acids in avocado moisturize and hydrate the epidermal layer of the skin. Oleic acid regenerates the damaged skin cells. In addition, the antioxidant carotenoids in avocado protect the skin cells against free radical damage. Mash an avocado into pulp without any lumps. Add a tablespoon of olive oil to it and mix with a spoon. Apply this mixture generously all over your face and massage for 5 minutes. Leave it on for another 15 minutes and then take a shower. Vitamin C present in lemon juice acts as an antioxidant that protects the skin against free-radical damage. Vitamin C also boosts elastin and collagen that holds the skin cells together. Lemon juice also helps to remove dry and dead skin cells from the skin. Add a tablespoon of freshly squeezed lemon juice to 2 tablespoons of olive oil. Mix it with a spoon and apply it all over your face. Massage for 5 to 8 minutes and then leave it on for another 10 minutes. Rinse off the application with mild cleanser and lukewarm water. Note – Avoid sun exposure for at least 5 – 6 hours after applying this process as lemon makes the skin photosensitive. The combination of vitamins and fatty acids in Shea butter helps to nourish and moisturize even excessively dry skin. Oleic, stearic, palmitic and linolenic acids present in Shea butter help to retain the natural oils in the skin and reduce the formation of wrinkles. Take 2 tablespoons of raw, unrefined Shea butter in a bowl and whisk it with a fork. Apply this mixture all over your face and massage thoroughly. Leave it on for 20 minutes and then rinse off with water. Repeat this procedure 2 to 3 times every week. The mild exfoliating properties of baking soda help to get rid of the dry and dead skin cells. It leaves the skin smooth and glowing. Take 2 tablespoons of baking soda in a bowl and add some water to it to make a paste. Apply this mixture all over your face and massage for 5 to 8 minutes. Rinse off the application with water. Follow this remedy 2 to 3 times in a week. Glycerin is a natural humectant that attracts moisture into the skin and prevents it from drying out. It helps to soften the rough and coarse texture of the skin. Take a tablespoon each of glycerin and water in a bowl and mix it with a spoon. Add a tablespoon of olive oil to it. After taking the bath, apply this mixture all over the face and massage it thoroughly. Repeat this remedy 2 to 3 times every week. The powerful anti-inflammatory properties of tea tree oil protect the skin against free radical damage. It promotes the renewal of skin cells by removing the damaged, dry and dead skin cells. Add 5 to 8 drops of tea tree oil into it. Apply this oil mixture all over your face and massage for 5 minutes. Leave it on for another 10 minutes and then take a bath. Follow this process 2 to 3 times in a week. Egg yolk contains a number of healthy fats that moisturize and nourish the skin. Vitamin E content protects the skin against environmental factors. Break 2 eggs and separate the egg whites from the egg yolks. Take the 2 egg yolks in a bowl and whisk it with a fork. Add a tablespoon of olive oil to it and mix it with a spoon. Apply this mixture all over your face and massage well. Leave it on for 15 to 20 minutes and take a bath with a mild soap. Repeat this remedy 2 to 3 times in every week. If you want to get relief from the itching and irritation caused by skin dryness then this method is effective for the same. Chamomile contains soothing properties which provide relief immediately. Combine 2 tablespoons of water and few drops of chamomile essential oil. Massage the mixture onto the dry skin for few minutes. Leave the application for 10 – 15 minutes. Repeat the process once in a day. Always opt for extra virgin olive oil that has a dark color for effective results. It is best to buy olive oil that is packed in a dark glass bottle. The dark color of the glass prevents oxidation of the oil. When applying olive oil to your skin, it is always important to be careful about the quantity. Excess olive oil application might make your skin excessively oily and lead to breakouts of pimple and acne. Olive oil is viscous in nature and it takes a bit of time to be absorbed into the skin. So, make sure that you have plenty of time in your hand when you opt for these olive oil treatments. Other than applying olive oil to your skin, you can also consume it for the extra moisturizing effect. You can add olive oil to your foods or just drink up a spoonful every day. Don’t take baths and showers using hot water because it is excessively drying. Use lukewarm water instead. Limit your shower or bath time to 5 to 10 minutes. Limit the use of cleanser and soaps. Make sure to moisturize your skin twice in a day. Wear a sunscreen every time you go out in the skin. UV rays of the skin dries out the skin and ages it. Cold and dry air during winter can worsen the problem of dry skin. Use a humidifier in your room to keep the air warm and moist. So, are you going to try olive oil for getting relief from dry skin? Do share your experiences or queries in the comment section below. How do I use olive oil daily for my very dry skin? I prefer not to have to mix with something else; I want something quick and easy.